Every month of the year there are jobs to do on a small Australian farm. Fruit ripens, lambs are born, hay is harvested. 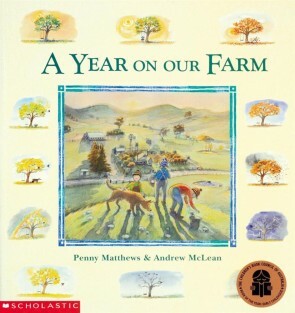 A Year on Our Farm shows the passing of the seasons through the eyes of the children for whom the farm and all its animals is home. 2003 Winner of Children’s Book Council of Australia award for Book of the Year: Early Childhood. Click here to read more about Andrew McLean. Andrew McLean is one of Australia’s best-loved and most highly awarded illustrators of children’s books. His CBCA award-winning titles include You’ll Wake the Baby!, My Dog and Reggie, Queen of the Street, and he has also illustrated a number of picture books with his writer wife, Janet. Andrew has illustrated three Aussie Nibbles: When Anna Slept Over, No Cat – and That’s That!, and Show and Tell. Andrew lives in Melbourne.